Who do you think you are…? Clothes Provided By: Kache By Angie, Junction Mall, Nairobi. ‘Please cover up this part, I always seem to look tired, so pile on the concealer’, I said to the make-up artist, pointing under my eyes, emphasizing on the dark circles that were impressed on my face, giving me a permanently exhausted look. It had been an insecurity of mine, among the many, for years. The make-up artist, a stout Afrikaner lady, smiled and began applying concealer a bit too generously, then powdered my face shortly afterwards so that it ended up having a cakey effect. Where there were dark circles, now there were bronze wrinkles. I sighed, looked at the clock above us and saw that I had ten minutes before I went on air for the first time, on the South African news network that had head-hunted me and relocated me a month earlier. The year was 2009, September. I’d arrived in Johannesburg three months later than I was supposed to because of complications trying to acquire my work permit. (Oh by the way, did I mention that this is where I ran into ‘him’ after so many years. He actually helped me carry my bags… but that’s a story for another day!) It had been such a grueling three months, packed with tension, blame games and bureaucracy that had left me drained and almost defeated. I say almost because after what seems to be the longest wait of my life, I finally got the permit and headed out for my new venture in a new country. The excitement, however, was all but gone by the time I boarded the flight from Nairobi. The wait, as I began to term it, had taken me back to a place inside me that I’d battled for so long…self doubt. Maybe I wasn’t good enough for this job? Could this be a sign? That took me back yet again to my days in primary school; the scrawny, peculiar girl with a weird voice and bullish personality. I was often picked on; it was difficult for me to fit in. From very early on I became a recluse and acted boisterous to disguise my insecurities. The plus side was having a supportive family and a group of family friends that embraced me for the most part. That got me through, but often made me socially awkward. A group of girls in primary school called me ‘frog voice’ because of my unusual tenor. All this built up and by the time I was sixteen, the advances I’d get from boys threw me off and it took me a while to begin to embrace my femininity. But the hardest part was always somehow feeling that I was going to fail. In my adult life, as I interviewed for jobs and got them, instead of being elated, my first feeling was fear; have they picked the wrong person? Did I really fool them into thinking I can do this? Though I’m haunted less by these voices, it doesn’t mean I still don’t, once in a while, suffer from a case of ‘impostor syndrome’. Sound familiar? Yup! There I was in 2009, about to go on air in front of the continent and all the while, there was still a part of me that was pinching myself; how did a scrawny girl like me, awkward voice an all, land here? What was I DOING here? Because after years of being too much or too little of something; too thin, too awkward, too serious, too young, too old, too short…I was convinced that to get to the next level in life I had to don the ‘impostor’ cap and work my way through it until someone ‘busted me’ and figured out that I was a fluke. It’s taken me some time to work past the impostor syndrome and embrace my abilities; truth is, we all have something that makes us good…no, great! We sometimes can’t see past the cloud of doubt or the misty fog that hangs around us, hindering the path we’re walking. Here’s how I beat impostor syndrome now; I shut out the noise and focus ahead. I take stock of the things I’ve achieved and allow myself to set goals within my reach. I walk with friends and family who genuinely believe in me. I pray, I search, I learn, I seek, not because I’m this ‘holier than thou’ person, (believe me I’ a work in progress in that department! ), but because I gain a certain perspective by taking time out to be with God. I read my first bulletin on South African television and managed to get through it with lots of nerves but a feeling of great accomplishment all the same. I still do, whenever I’ve read a bulletin. Whenever I find myself doubting my abilities, I’m now quick to remind myself of all my accomplishments…that after all that’s said and done, I’m not doing too badly! If you feel like you’re struggling with a self-esteem issue that’s really holding you back from moving forward and want to talk to a professional about it, please visit www.kpsya.or.ke. They have a database of psychologists who could help you. I admire you Janet,,,expearing me alot …..Keep doing wat ur doing Lady. Wow thanks for speaking directly to me,I needed this today at this very moment. God bless you Janet, may God continue to expand your territories. 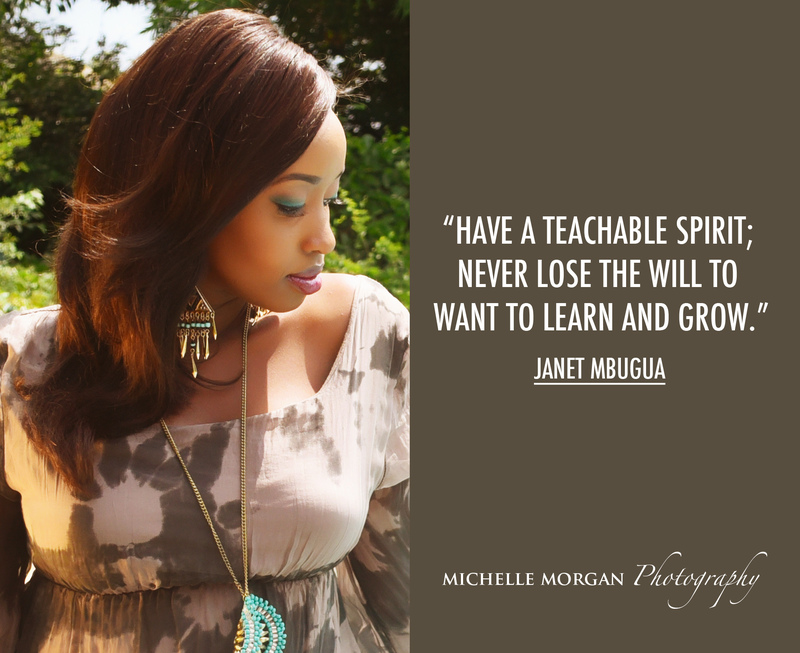 you are really an inspiration janet.why lie this blog is my ultimate daily bread. This shows how far we have come from and we are still going far. When i read this it reminds me of my low moments and when am almost giving up and my inner self tells me that i shouldn't give up as i have long way to go…..and another things that comes up to minds is how many people envy who i am and would love to be where i am…..thank you Janet once more. I just discovered your blog today..I wonder where I have been..Am soo happy to know that you are such an inspirational woman..I have soo been encouraged by your posts…I have had a very low esteem for a long time and reading your posts has really lifted me up. Thank you so much…I will wait for more! Even though 19yrs, I am always amazed by your posts. They are diductive, and immensely inspiring! I marvel at your understanding of life. I am thankful for the fact you find it fit to share it with us. You are amazing Janet. I may not meet you to tell you this, but always remember that you are a model lady. Your virtues though silently observed speak volumes. Your character moralizes. You are amazing! Thanks for your encouraging words. im so proud of you. Be blessed of the Lord. What a story Janet.. I am so inspired and learn't that i should never ever give up! This all i neede i actualy ened up emotional,i thought am the only one who alwas feel even.if i start i will fail,having tried so many things n failing and having noone who believe in me….i think.i need a counsle that will help me raise my esteem i try to get a thing to celebrate in my life and am.sorronded by failure evry time i get a job i end up loosing becouse of some funny mistake.i always fight with people around me coz i feel the dont love me..i am rude becouse i alwas feel like people see me a faliure and that am not meant to have a good life….i am.not sure what the future holds gor me…am heartbroken n wish i would get out of this cacoon God sometimes i wish my mum lives on maybe she could have helped me gain my self back.am so bitter with life,am so full of pain….but this post has touched me and i hope i will get out of this.i long for a happy life without gradges and being too personal….i need someone to help me through this journey…. Janet.. you are a supermodel…keep up the good work..inspire to inspire before you expire! Oh thank you Nelly, I appreciate your support. Be blessed! Thank you so much Janet. Your posts inspire me a lot. I am going through a difficult moment right now, but reading your posts has given me a renewed zeal and confidence to face tommorrow without any fears or anxiety that i will fail, because i know im good at what i do,and i need to remind myself that every single day. Thank you and i can't wait for the next post. It makes me so happy to hear that Roselyne. We all go through those difficult moments but what Ive learnt is that we can all weather those storms. All the best and thanks for reading my posts! Continue with the sprit, i love everything you write, we all have that weakness. cant wait for the next one. Thank you so much for your comments Njeri, God bless. Bless you, Tina. All the things you want to achieve, go out and achieve them. Keep praying, I can see it has given you strength so I encourage you to keep doing so. Thanks for reading my posts and finding inspiration in them! U are my source of inspiration Janet.I follow all your posts closely. I became a mom while in my 3rd year at the university. ..through pushing on n determination I completed 8.4.4 yesterday. Well done for you Maureen. I'm glad to hear that no matter what challenges you went through, you pursued your studies and continued to set goals. I hope your little angel is giving you more hope everyday! Thank you Natasha! I hope you feel encouraged to feel better about yourself. Keep shining! but at the core of it, is the fact that this is a raw, authentic and poignant look into Janet's life. no, not Janet the sassy and courageous woman on screen, nop. the Janet who we can all relate to amid her silent struggles, her dark doubts and overall, the essence of the strong woman she is! always refreshing to read a post, and this one is such a surreal one. I battle with this so many times, imposter syndrome. still working through it, and empowering the voice that tells me I can nail it (whatever challenge is is). Write on Janet. Wow thank you Samoina! That just makes me want to keep encouraging you and many others. Yes I felt like it was time to be vulnerable and it has truly made me feel liberated. Keep reading and I hope now you've subscribed! Janet – This is such an empowering read. Thank you. You have captured and reminded me of my own life mantras: Self love, belief and courage to push through any fear (be it of action and/failure). Just like you, I've learned along my own journey the importance of understanding my strengths celebrating them but to also understanding and owning my weaknesses. It has taken me years to understand that my weaknesses are not failures, they are just things I am not particularly good at. Now that I have understood that it empowers me to get the necessary support. In the past have been my greatest champion and worst critic at different times. I’m now consciously and deliberately making the active decision to be the former MOST of the time. It’s a training will never end but is made easier with reading blogs like yours. Sending you positive vibes this Sunday. Hi there Catherine! First of all you write beautifully ? perhaps an account of your own journey is in the works? Secondly, I can see we have something in common, being our own best champions and worst critics. It takes time to be proud of who we are but let's never stop getting there. God bless you! hey Janet, I would love to subscribe to your blog, But I don’t seem to find the link. Hi dear you can now find the subscribe link on my blog. After reading your post i can now see how your journey has led you to the point where ordinary people can now celebrate you the way we did at the prize giving event at Loreto Convent Mombasa where you were the guest of honour …..looks like you may never run out of posts ….even there your story came out strong and encouraging "short and sweet " as you had planned….Dont stop!! Thanks Caroline! I'm glad you were there to celebrate that moment with me ? be blessed! Oh that's nice to hear Nancy! I hope I can read her articles some day! Give her the biggest hug from me and God bless you both! Haha! Tell her to be proud of it. When she's of age, be sure to get her enrolled in debate club. That was my stepping stone! I always have these ‘lots of nerves’ Janet.Thanks for making it known that we can always get through them. Thanks dear. Much love right back atcha ? Thanx for sharing its so relatable. I have achievements that sometimes I don’t think are mine. Exactly as the impostor syndrome, the external evidence is there that you have achieved,but deep inside you doubt yourself. Thanx for sharing its so relatable. I have achievements that sometimes I don’t think are mine. Exactly as the impostor syndrome, the external evidence is there that you have achieved,but deep inside i doubt myself. So inspiring dear…I always have that feeling of self doubt but been working on it…continue to inspire young women…we need more of this to make it in this tough world. I go like shez a superwoman. i enjoy your posts n you are so brave to share all this with us. cant wait for whats to come. all the best n God bless. I love the post Janet…I finally got an answer, what did you call it again?oh “imposter sydrome”..en thanks to you I naw know how to fight it.thank you again, I should say girl,you are a hot bed of good advices en a hell of a writter too..lots of love. I have never thought or heard of Impostor syndrome. So many people believe in my abilities but me? I am my biggest non-believer. I attribute it to anything n everything from luck to fluke. Thanks a lot Janet. From now on, YES I CAN!!!! Yes you can Ree! Impostor Syndrome should never hold us back for long. All the best! The Subscribe button is here finally. Awesome. Godspeed Janet…. Nice article Janet!I can highly relate to this,After clearing my high school in 2011 I never knew what next would happen to my life.Most of my friends got their results and joined colleges unfortunately I din’t get any chance even to do a Computer course because of some unavoidable circumstances…. My soo close friends started distancing themselves from me simply because we our lives couldn’t match anymore but I never loosed hope… A time came that I couln’t hold it anymore,a dark cloud started covering my smile,I felt hopeless,a voice kept telling me you can’t make it!I strived though haven’t really achieved what I really wanted through the grace of God I will….Iam whom iam today because of his grace hoping to continue with my college soon….Janet!Be blessed,you are a flower that I always look at,you inspire me soo much!God bless you! Thank you my dear! I pray that the dark clouds that hover above us from time to time do not engulf us! Keep praying dear and keep believing in yourself! Be blessed! Don’t worry Everlyn I was in the same situation. I stayed for 5 years at home but God was always with me. Look at me now am doing my final exams at kemu. Keep on trusting and you will achieve what you want. Amen! I am touched Janet…sometimes one can see you on the screen looking all okay and I always ask myself do you all go through difficult moments or is it all rosy….am glad am reading your diaries…am more than encouraged….am about to set my journey….I hope I will shut out all the forces as well. Keep moving dear…. I too find myself questioning my abilities every so often. However, taking stock of the achievements I have so far keeps me going. Thank you for doing this. You have no idea how many people’s lives you impact by opening up about your experiences. That is such an amazing article. I did not know there was someone else who had fears like mine. If I would put it that I am inspired, it would be an understatement. as an upcoming journalist( still studying) I would so much love your advice. I put my email above. I do blog too and yours got my attention. You made it. God be with you always. going through kinda same situation..inspired ,thanks janet.. I'm happy to hear that Winnie! As you continue to find yourself and learn yourself, be encouraged; we're many who are also seeking to become better versions of ourselves. Thanks for reading my posts! Thats me now! in USA not too sure if I made the right move, God has brought me this far, with ur advice I must do it! Hi Mueni! Don’t doubt yourself – although it must be nerve wracking for you, think about the access to great opportunities you have there! Like Obama said, Africa is on the move. Right now people are looking at Africa as the next big thing. Position yourself there, you never know! All the best, thank you for reading my post ? Be proud of who you are dear; everyone has something unique about them that, find that thing and celebrate it! ? Beautiful piece and true story, I can relate to that. Thank you! Thanks for reading Olive! Glad you found it relatable! sometimes we have to struggle past our insecurities….that is what have learnt from this post so inspirational…. Yes Emmanuela sometimes we had to push past those insecurities and believe in ourselves, even when no one else does! Even in these times you think things ai'nt as good as u would have wished,I can assure you all is well.Romans 8;28.You sharpening yo writing skills really and one day, you will pen down a book.